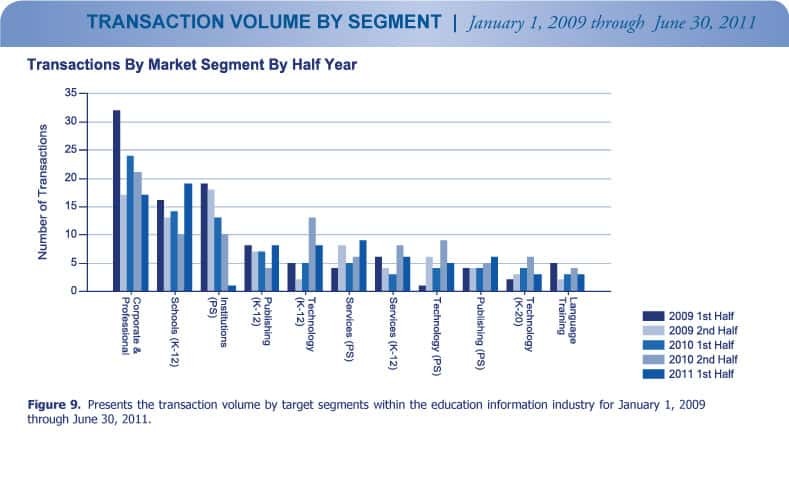 1st Half 2011 Education Industry Trends - Berkery, Noyes & Co., LLC. 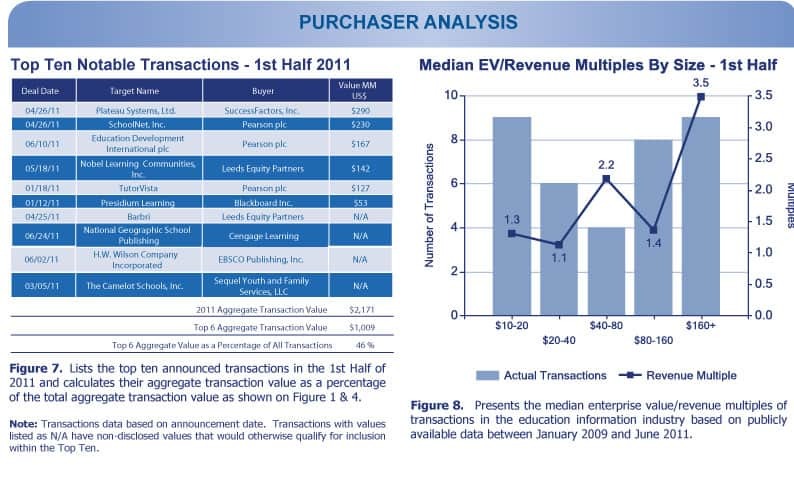 The largest transaction in 1st Half 2011 was Plateau Systems, Ltd.’s acquisition by SuccessFactors, Inc. for $290 million. Pearson plc was the most active acquirer in the first half, announcing four acquisitions: Education Development International plc, SchoolNet, Inc., Smarthinking, Inc. and TutorVista. There were 17 financially sponsored transactions in 1st Half 2011, with an aggregate value of $174 million, representing 24 percent of the total volume and 48 percent of the total value, respectively. 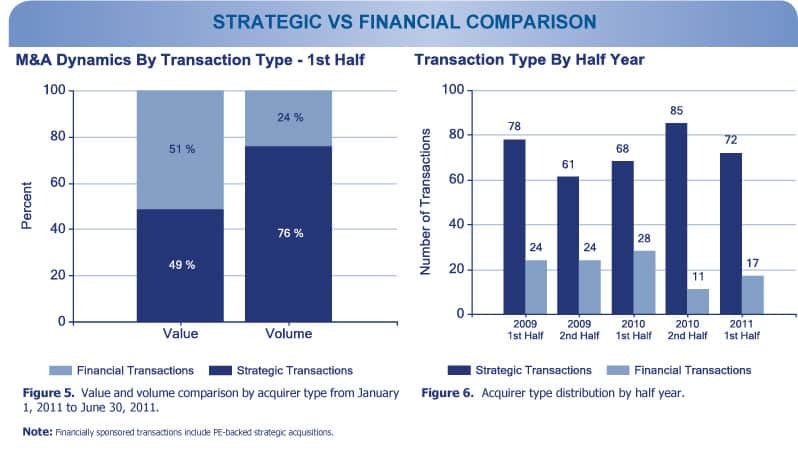 Total transaction volume in 1st Half 2011 decreased by 7 percent over 2nd Half 2010, from 96 in 2nd Half 2010 to 89 in 1st Half 2011. 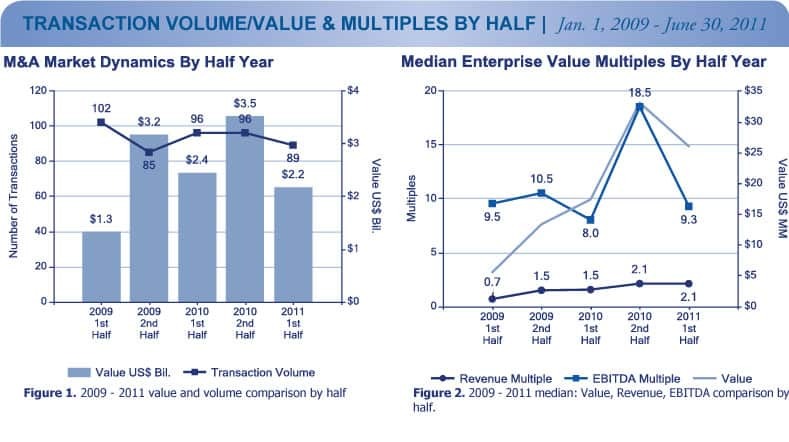 Total transaction value in 1st Half 2011 decreased by 57 percent over 2nd Half 2010, from $3.3 billion in 2nd Half 2010 to $1.4 billion this year. 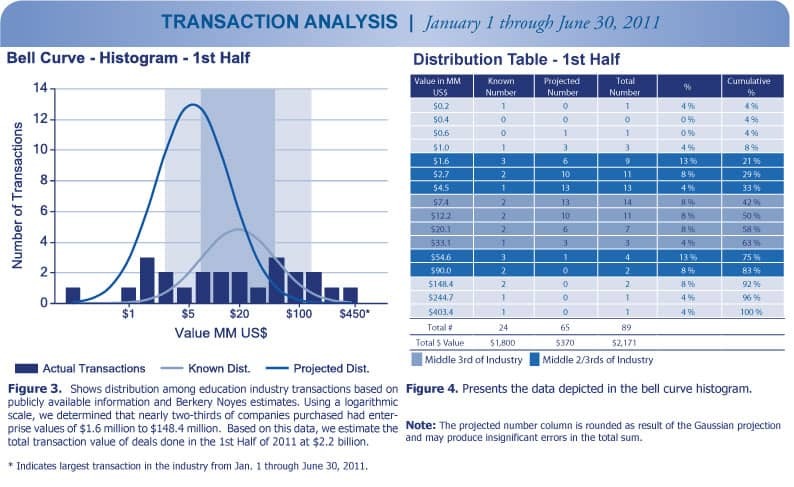 Berkery Noyes tracked 468 transactions between 2009 and 1st Half 2011, of which 144 disclosed financial terms, and calculated the aggregate transaction value to be $10.4 billion. Based on known transaction values, we project the value of the 324 undisclosed transactions to be $791 million, totaling $11.2 billion worth of transactions tracked over the past two and a half years. Pearson plc, was not only the most active buyer this half year, but also the most active acquirer in the two and a half years covered in this report, making 17 transactions: Education Development International plc, SchoolNet, Inc., Smarthinking, Inc., TutorVista, CTI Education Group, The Administrative Assistants Ltd., America’s Choice, Wall Street Institute, Inc., Learning Systems Business from Sistema Educacional Brasileiro, Cogmed, The Learning Edge North America, Melorio plc, Assessment Training Institute, A+Rise, WSI International, Inc., Wall Street English and Intellipro, Inc.
Disclosed median enterprise value multiples for the time covered in this report were 1.5 times revenue and 10.2 times EBITDA.